There are three main methods you can use to destroy data on a hard disk drive (HDD) or solid state drive (SSD). First method is utilizing a standalone device or system with software that will wipe (aka Sanitize) data by using data overwrite method such as DoD 5220.22 M or NIST SP 800-88 compliant methods. Once has been overwritten, you will no longer be able to retrieve data and hence these drives could be put back into production, recycled, donated to charitable or otherwise disposed off. Second method utilizes a degausser which not only destroys data but permanently damages the hard disk drive rendering it useless. This method is a must especially when your hard disk drives cannot be wiped/sanitized if drive is defective and cannot be accessed except utilizing some method of data recovery. This method is superior to the first method in terms of speed as it takes less than 10 seconds to degauss most hard disk drives. This method employees very high burst of magnetic field for seconds at a time on disk drive which effective erases all data and renders the drive useless. Third method involves physically shredding or crushing the hard disk drive rendering it useless. This method utilized equipment that ranges from a hand crank crusher to a highly motorized automated shredder capable of shredding thousands of disk drives per day. While any of the above methods will securely destroy data permanently on your hard disk drive, most experts believe its best to use at least two methods if your data is of very sensitive nature. The Crunch 250 is a powerful and fast data destroyer that crushes a wide range of storage devices. Simple and safe to operate, destruction of media is guaranteed. Its unique log system records all destruction information giving hard copy evidence for audit purposes. The PD-4 destroys up to 360 - 1 inch hard drives per hour (when crushing two 1 inch hard drives at a time). 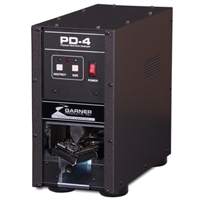 The PD-5 Physical Hard Drive Destroyer, destroys up to 240 - 1 inch hard drives per hour (when crushing two 1 inch hard drives at a time).